Keep your outdoor living area stylish, clean and beautiful! Protect your deck and patio from oil and grease damage. This fire resistant mat is stylish and easy to clean. *Not recommended for use on composite decking. 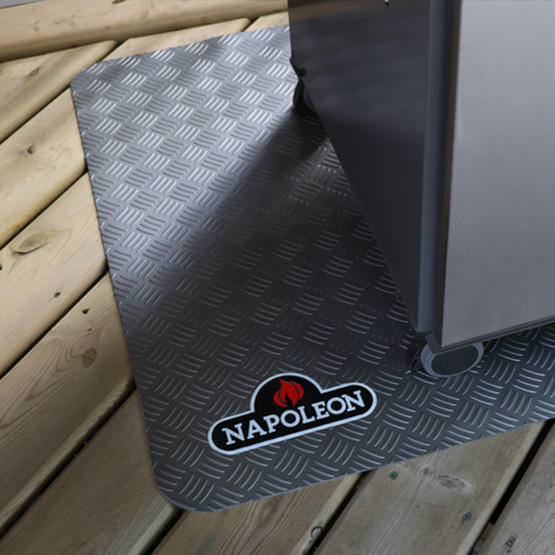 Protect what’s under your grill and show your Napoleon pride with the Napoleon Grill Mat. Great for ensuring your deck and patio are safe from oil and grease damage, this easy to clean mat fits perfectly under Prestige / PRO 500 Series and smaller grills. If you’re using a charcoal grill, this fire resistant mat is perfect, providing protection against accidentally dropped coals and errant sparks as well. The non-slip, diamond plate pattern is a stylish grey color, ideal for upping your grill’s style factor while protecting your beautiful outdoor living area. Not recommended for use on composite decking. 19” Premium cedar bbq scraper.